Bike taxi and hyperlocal delivery app NOW has secured $500,000 (Rs 3.35 crore) in angel funding from Jaipuria Group's managing director Ruchirans Jaipuria and Supreme Motors director Anuj Sanghi. Jaipuria and Sanghi have already invested $200,000 (Rs 1.34 crore) and the remaining money will flow in subject to attainment of certain performance milestones, Vivek Pandey, co-founder and CEO of NOW, told Techcircle.in. 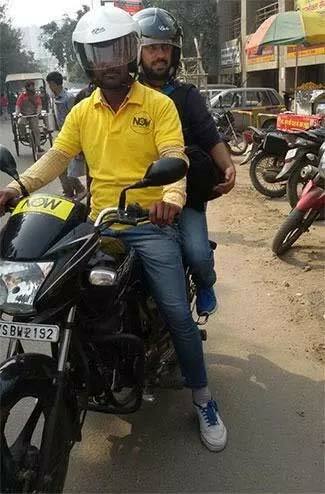 NOW, run by Noida-based TapTap Meals Pvt Ltd, provides on-demand two-wheeler rides besides facilitating horizontal delivery for individuals and businesses through its bike taxis. It facilitates delivery of courier, food parcels, medicines and grocery, said Pandey. The startup claims to clock about 250 daily trips in the NCR region. NOW's parent pivoted from running food delivery app TapTap Meals to its current avatar in October 2015. "The ability of the team to demonstrate scalability and the idea that the business model has both a national as well as a hyperlocal play, led me to invest in NOW. There were obvious inherent synergies with our existing competencies (at Jaipuria Group) and together we can help grow this venture into a thriving business," Jaipuria said. NOW was founded by Pandey, Bharat Khandelwal, Sushant Arora and Parteek Singla. Pandey, an alumnus of IIT Kanpur, had previously worked with companies such as Flipkart, Goldman Sachs and Morgan Stanley. Khandelwal was earlier associated with Times Internet and Unicon Investment Solutions. Arora has earlier worked with Flipkart and has experience in supply chain management. Singla co-founded gadzet.in before joining NOW. In January, NOW had raised an undisclosed amount in seed funding from boutique investment banking firm Maple Capital Advisors' recently launched startup accelerator platform. The last two months have seen the emergence of a new segment in the crowded intra-city transport space â€“ bike taxis. These tech-enabled ventures address last-mile connectivity issues in cities such as Gurgaon, Noida, Bangalore and Mumbai. The space has caught the attention of well-funded urban transportation majors. Last week, ride-hailing app Uber and homegrown Ola announced their entry into the business of aggregating bike rides. This would change the competitive dynamics for smaller bike taxi startups such as Baxi, M-Taxi, Bikxie, NOW, Hey Taxi and Hey Bob. Baxi, which runs a bike-ride hailing service, had raised Rs 10 crore (around $1.4 million) in a seed investment round from a clutch of HNIs a few months back. Another player, Ace Fenders Travels Pvt Ltd, which runs the M-Taxi app, had received investment from angel investors Mandeep Singh and Jairaj Singh. Madhatters Voyage Pvt Ltd, which runs a two-wheeler taxi service called Bikxie, secured angel investment from an investment banker in the Middle East and a businessman based in South India. It may be recalled that Goa was the first state to institute bikes as a taxi service due to tourism. The Goa Motorcycle Taxi Riders Association (GMTRA) was set up in 1981 to allow drivers, referred to as pilots, to ferry around passengers on their bikes for a fee. However, today, the service is dying out in the state as people prefer renting out bikes. The biggest pain point facing tech-enabled bike taxi ventures is the regulatory hurdle. While the Haryana government has given the go-ahead for bike taxis to operate, the governments of Karnataka and Maharashtra are yet to issue contract carriage permits for bikes, which is what is issued to auto rickshaws. Despite this, Hey Taxi and Hey Bob are able to offer their services in Bangalore and Mumbai. Instead of a full-fledged taxi service, Hey Taxi offers a courier and a passenger service through a ridesharing model. Hey Bob has applied for a licence and is working in tandem with the state government to get the service rolling in Bangalore.